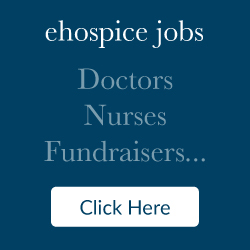 Categories: Care, Community Engagement, Education, Featured, Leadership, and Must Read. Tags: 5th National Palliative care conference, Hospice Africa Uganda, KEHPCA, KNH, Makerere University, Nairobi Hospice, and Rays of hope Hospice Jinja. 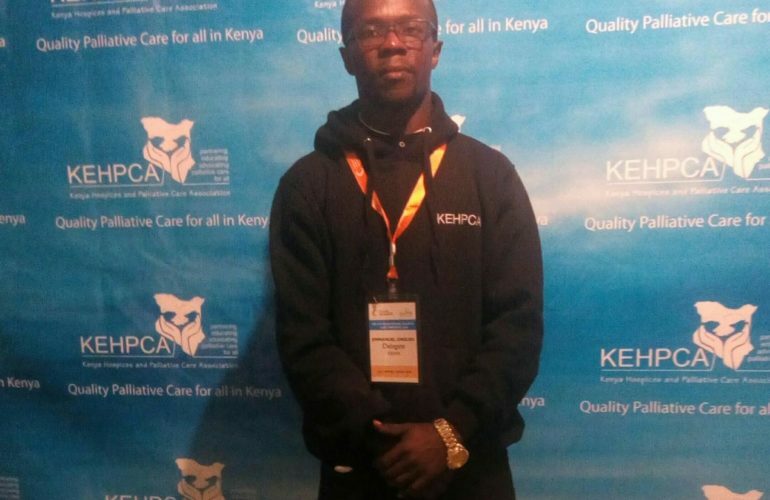 “Receiving a full registration sponsorship from KEHPCA to attend the 5th National Palliative Care Conference in itself was certainly a stroke of luck, I was very excited”, Says Emmanuel Mayaka Onduso who is a Kenyan student currently pursuing a Bachelor of Science in Palliative Care at Makerere University-Hospice Africa Uganda. He also works at Kenyatta National Hospital in the department of orthopedics as a Prosthetist/Orthotist. Having been a palliative care team member at Kenyatta National Hospital (KNH) and a dedicated palliative care student at Makerere University, his senior lecturer had mentioned to him earlier this year that he would be attending a conference organized by KEHPCA in November. Emmanuel got interested but unfortunately he did not have enough funds to enable him to register for the conference. Emmanuel comes from a low resourced background. Unlike many university students, he solely supports’ himself in order to study from the little that he receives from his job. Out of his enthusiasms and curiosity to attend the conference he went ahead and contacted KEHPCA in order to find out if he could do any voluntary work so as to be allowed to attend the conference and unbelievably KEHPCA accepted to pay his registration fee and even sent him an invitation letter to release him from work. 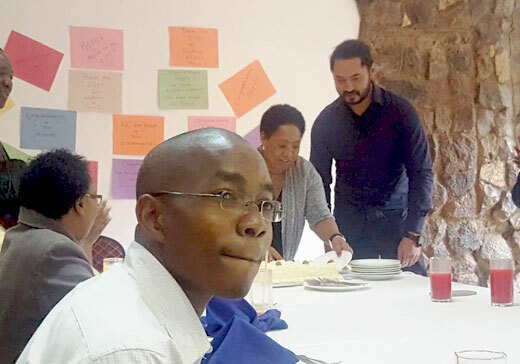 He says that when he initially started working at Kenyatta National Hospital (KNH), he had been focusing so much on the clinical and technical aspects and forgetting the holistic management of pain and needs of patients, then one day as he searched information online, he came to learn about Nairobi Hospice. He visited the hospice; a visit that enabled him to learn about various courses that the hospice conducts. 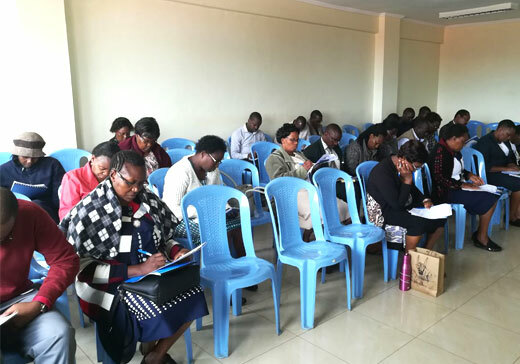 He signed up for the introductory course in palliative care hence gained insight on the subject and further developed interest in palliative care. He then decided to further his studies in palliative care at Makerere University which to him was an answered prayer. Emmanuel terms the experience he got from the conference as `heavenly’. He says that apart from just networking and getting to know the situation of palliative care in the country, he also attended some workshops during the conference and listened to presentations that will go a long way into widening his experience both at work and at school. While at home, Emmanuel visits persons living with palliative care needs (PLWPCN) and as an Orthotist he has learnt to see the better side of patients especially those suffering from breast cancer as these are the commonest patients he interacts with in his line of duty. At school, he is the president of the student guild and he leads his fellow students who are health care workers from over five countries in Africa. Emmanuel wants to be a friend of KEHPCA not only because of the level of professionalism he saw and love that he received before and even during the conference but because he also believes that the future of palliative care in Kenya lies in the hands of young people like him and that he has a special calling for palliative care. In the near future, Emmanuel made a commitment to be involved in the outreach programs with Rays of Hope Hospice Jinja-Uganda, the leaders whom he met during the conference. He expects to reach out to patients and be part of a team that will help improve the quality of life of patients suffering from life-threatening illnesses and their families. 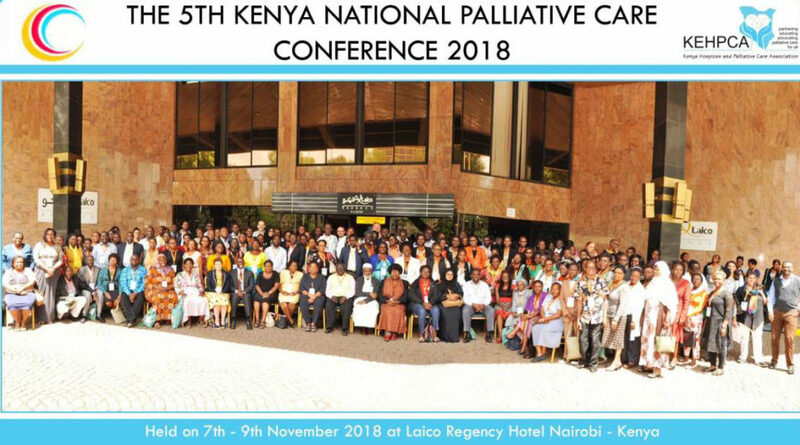 Emmanuel said he will forever remain thankful to the almighty God and to KEHPCA for allowing him to be part of a very golden opportunity –Participating in the 5th National palliative care conference 2018; an experience he will never forget!